In each page of Flag Creator at the lowest part of the page you can view the FlagLogo Preview. Note: if you have not made yet a FlagLogo and don’t want a TeamLogo this preview will be blank. First of all you have to download all Hattrick flags that you have obtained until now. At this point you need the source-code of the flag-page within Hattrick. You can get it by right-clicking and choosing for "view page source" or "This frame -> view frame source". In FireFox: right-click near the flags (on a blank space); select “This frame” and then click on “View frame source” and copy all the text that will appear in the new window. In Internet Explorer: right-click near the flags (on a blank space); then click on “View Source” and copy all the text that will appear in the new window. After that you have copied this code, paste it in the window that will appear after you’ve clicked on “Paste them”. In this page you can make a choice for your TeamLogo, to be more precise: we, with the word “TeamLogo”, mean the really coat of arms of your team. 1) Images need to be png, jpg or gif types. 2) Animated gifs are not supported, so the first frame will be taken. 3) Images can't be larger than 150 kb. 1) Upload logo: make this choice if you have your TeamLogo on your Hard Disk. If you want to upload a logo: click on “Browse”, select the image file (see Restrictions), click “Open”, and finally click “Upload”. 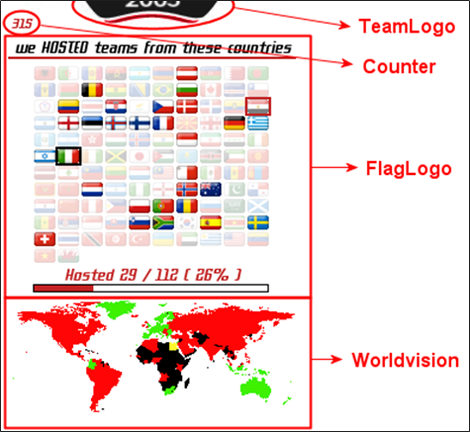 2) Use logo located on the web: you need to copy URL of your TeamLogo in the textbox, and then click “Upload”. 3) Use current HT logo: check this box if you want to use the TeamLogo that you already selected in Hattrick, and then click “Upload”. The number of rows will be defined in consequence of this number. You can select it by left-clicking on the box. There are 8 types between which you can make your choice. You have the opportunity to highlight your home country compared with the other ones. You can make it by selecting the color and the thickness of the line that will be placed around the flag of your home country. If you don’t want the line and don’t want to highlight your home country you have to click on No border in this box. Here you can select the percentage of opacity of the flags that you have not yet collected. This flags are different for the FlagLogo that you choose to use. For example: if you want to show the Hosted FlagLogo you are selecting the opacity of countries that you have not yet hosted. If you don’t want this highlighting, simply uncheck this box. Here you can select the percentage of opacity of the flag that you will meet. If you don’t want the line and don’t want to highlight your next country you have to click on No border in this box. 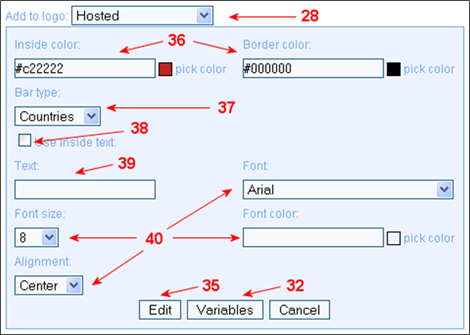 Here you can select a general setting for the font that you will use in the next steps. Note: The options you choose here will be used in the next step as defaults. You always can change it for every text separate, to give your layout a better style. For example: if you want to add these items to the Hosted logo, you have to select it first of all. After this click will appear a new small window. Here you can make your choice to which variables put into the text simply click on the variable you desire. Note: you can manually put the variable by writing the code that is between brackets for each one variable. After this click will appear a new panel, here you can customize everything for a text. After this click will appear a new panel, here you can customize everything for a bar. Coolness: this bar will show Percentage of Coolness Rating collected. For example: you want to add the “Countries bar” with inside color “#c22222” and border color “#000000” without inside text (the box is unchecked). After this click will appear a new panel, here you can customize everything for a line. For example: you desire an “8 pixel” white line (color “#FFFFFF”) that will go on from the outmost left to the outmost right (width percentage “100%”) adjusted to the “center”. You can choose the color for Hosted, Visited, Hosted & Visited, Supporters, Next country, Not done, Not in Hattrick. For example: you want green (color #3EF100) for Hosted countries; no color (color blank) for Visited, Hosted & Visited and Supporters; yellow (color #FFF82C) for Next country; red (color #FF0505) for Not done (these are the countries not yet met) and finally black (color #000000) for the countries that are Not in Hattrick. Unique Visitors Counter: this counter will count all different visitors who will visit your main page. If the same user visits more then one time your main page, this counter will increase only the first time. All Visitors Counter: this counter will count all the time that your page will be visited. If the same user visits more then one time your main page, this counter will increase on each one visit. You can choose the starting value of the counter by writing it in the appropriate box (arrow 52). Then you can use an Image Counter in place of a simple text. If you want to use an image for the Counter, simply select it with a left-click on the appropriate box. Finally you have to set the right and up offset. You can do it by checking the box Edit Offset (arrow 55) and then by clicking on the FlagLogo preview in the point where you want to place it. For example: you want to add a Unique Visitors Counter, you desire “315” like starting point, you want that it is in the text form and will make your choice for the font (type “Hattrick”, Height “8” and color “#C22222”) and you want to place it in down left (X Offset “3” - Y Offset “292”). Note: if you don’t save your logo, you can’t use your logo. And if don’t save your logo and close the page you will lose your setting not saved. After this click, you will be automatically redirected on the Grab Codes Page. Here you can copy the URL of the logo you prefer to use. Note: text and bars will appear only in the logo you have added in.